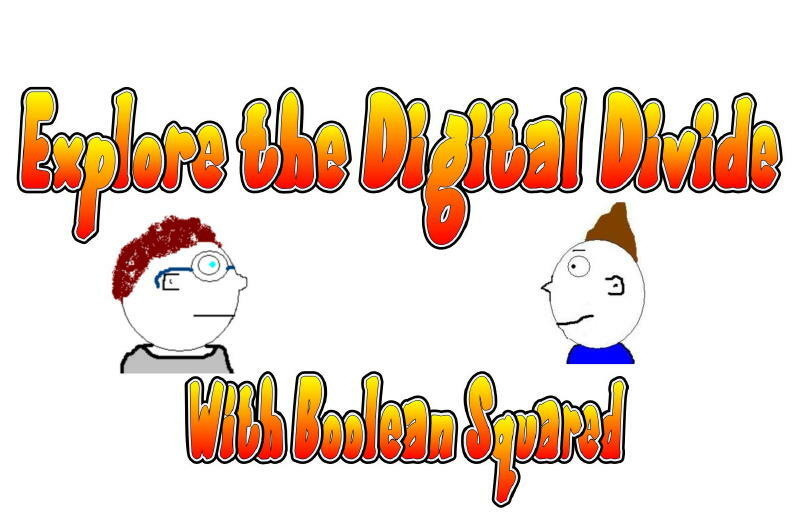 My webcomic Boolean Squared continues to ponder the question of what happens when you let kids become the technology saviors of your school? Hmmmm. This is my final reflection on the movie project that I did with my students recently, using stop-motion moviemaking to demonstrate a literary idea. Part one dealt with student reactions to the endeavor; Part two was how I implemented the project; and Part three was how I published the videos. This is about how I am going about grading these 31 movies. I think it should be stated outfront that assessing digital projects can be difficult, as technical difficulties can sometimes get in the way of executing even the most perfect idea. So, I do try to keep an open mind, even though I lay out parameters of expectations to my students from the very start. I remind them that this is all fun and exciting, but it is also a learning experience and they need to show what they have learned. Effort and imagination and patience would be rewarded (10 points). This weekend, as I looked the movies over more critically than I have before, I realize that some groups just got caught up in the movie aspect, and gave only a head-nod to the actual assignment. Others found a story with a focus and told it through a movie as best as they could. Still others … well, they just created odd movies. I know almost every student loved this project and now understands something more intangible: how to manage a complicated project with many layers of composition, work with others in a cooperative venture, and publish a movie to the world. I didn’t grade these aspects, but they are as important as the area that I give points for, in my opinion. In the ideal world, the grade would not be required. So, the average grade hovers around a solid “B” range for the classes, but the memories of making a movie will last long after the report cards go out and get lost in the dust bin of history. This is the third of a four part series of posts on how my class went about planning, writing and producing short stop-motion movies on the theme of literary terms (see part one and part two). My idea here is to allow me some space to reflect and hopefully, nudge a few of you into moviemaking. In my last post, I talked about the actual making of the movies. And now that they are done, what do you do with them? Well, many of my students now have their own flash drives (and our class has a few that we loan out), so getting copies of their productions is easy enough. It used to be a lot more difficult — burning DVDs, etc. Flash drives are wonderful. Our movies are being made for a wider audience, however (including a few that will become part of The Longfellow Ten project). SO, we wanted to publish the movies to the web for a potential world-wide audience. This is a tricky decision — where to host the videos and where to publish them. I have tried all sorts of services over the years and to be honest, I find most of them lacking in one way or another. My own goals are for a site that hosts videos, with no links back to the site, no advertising and ease of use. Does that seem like too much to ask for? In this vein, I have worked with YouTube (no need to say a thing), Google Video (better but not great, and I don’t expect it to last as a separate entity from YouTube), Edublogs TV (it has potential but slow to upload, in my opinion), TeacherTube (unless it has been fixed, it had become incompatible with Edublogs), Blip (it’s fine), Flickr (you can upload and share short videos under the plus account) and more. Luckily, my friend, George (of the Longfellow Ten), had been on the same path and he found Vimeo. It turns out that more than a year ago, I had checked it out too and forgotten all about it. Vimeo is like a typical service except you can really adapt the embedding option. This allows you to remove any and all links back to Vimeo itself. All the students will see is the video and the play/volume buttons. This is exactly what teachers need, I think. Both George and I upgraded our accounts because we both know that we will be using it for larger video projects down the road, but the free version seems fine. It’s also nice because you can save a preset for embedding — you don’t have to revamp the embed code each time. So, I now had a reliable and useful host for my videos. But I don’t want to direct my students to Vimeo to view the movies. I want to create our own space for publishing the video collection. (George is using WordPress.com for the Longfellow Ten project, which is nice because Vimeo is incredibly easy to embed in WordPress blogs). I thought about using our classroom blog — The Electronic Pencil — but with 31 videos, that seemed like too much (particularly when Edublogs suggests you don’t publish more than one video per post). I thought about whipping up a quick webpage with html/dreamweaver. But then, I would have to host the page. Finally, it dawned on me that a wiki might be the best option. Easy to use, a wiki also allows for multiple media files per page. So, I went to my wiki companion site for The Electronic Pencil (over at Wikispaces), and started to embed the movies. It worked like a charm, and it also allowed me to show my students a wiki, which we will be using later this year for our Crazy Dictionary Project (now four years running). Last, I made a link to the various movies from our class blog site, had my kids view them one class period (so they could see what their classmates have been up to), and then I had them reflect about the movie project at our blog, thinking about what they liked about making the movies, what they didn’t like and what they would do differently if we started over again (maybe later this year). In my last post (part 4), I am going to talk about how I am grading and assessing the movies. This is the second post around making stopmotion movies with my sixth graders (see the first post) and I want to talk about how we actually did it. My hope is that one of your (dear readers) may want to replicate or build on the experience and so my path may help you along on your own movie-making journey. First of all, I launched into this project because I received an email and a phone call from George Mayo, another middle school teacher who has done some wonderful collaborative work in the past (see, Darfur awareness project). He and I have communicated about claymation and I showed him a few ways to get started. Now, he runs a movie club and his kids began making stopmotion movies around literary terms as part of a secret collective called The Longfellow Ten. He wondered if I might want to have my students join in the fun. So, I scrapped one of my projects and moved into moviemaking. How could I not? But I knew with four classes of students (about 75 kids), it would be hectic. And a bit crazy. And also a great time. (It helps that I have done claymation a number of times now, including summer camps. I would not have launched into something this big without those experiences under my belt). I began by showing my students the short films that George’s students had already published and talked about what stopmotion is. Luckily, just about everyone has seen Wallace and Gromit, so there is a common thread to talk about (and, one day when I was out, the sub showed them the Behind the Scenes of the Making of The Curse of the WereRabbit movie — an incredible documentary of the work that goes on — it’s on the movie DVD). My students then either got into small group, or worked independently (no group bigger than three — that’s my rule). I handed out slips of paper with literary terms (such as plot, setting, foreshadowing, etc) and their job was to build a movie that discussed, defined or demonstrated that term. This all begins with storyboarding out their story, conferencing with me, and having a clear plan of action before they even touch the computers. Here is what I preach every single day, ad nauseum: patience. If they can be patient, and move their objects slowly, and capture a lot of footage, then their final movie will be of higher quality. I also tell them to film more than they need, since they can always edit out footage but adding new footage in is difficult (you have to reset the scene, etc). In MovieMaker, they edit out their inadvertent hands, add titles and credits, and insert transitions between scenes. Then, we plug in microphones and they begin their narration. The syncing of voice to video can be difficult and it requires … more patience and also, some editing on the fly. I often show them how to use video effects to slow down footage or to capture a still image to insert into the video in places where more dialogue is needed. We then gather up their project (usually only a minute or two long at most) and create a video (use the DV-AVI setting in Moviemaker for highest quality). For some groups, they are done. For others, however, they can make their own music soundtrack and we use a software program that I bought called Super Dooper Music Looper, which allows them to use loops to create songs. They love this software! (But George has also shown me a few sites that allow use of music, too: CCMixter and Freesound). If they want to add music all the way under their movies, they need to re-import their video (with narration, titles, etc) and then layer the music, and then make the video a second time. Phew. There are a few steps to this process, aren’t there? The result? A student-created movie from start to finish. In part 3 of this reflection, I will talk about how George and I are posting the videos online (hosting and publishing) and then, in part 4, I will talk about the task I now have of assessing their work — for this is a graded project, with parameters that I established at the very beginning of the process. Now that my project to create stop-motion movies around literary terms is over, I thought I would reflect a bit on the experience in the classroom. First of all, this is the first time I worked on movie-making with all four of my sixth grade classes (about 75 kids) and it was a bit daunting. There ended up being 31 short movies created by small groups of students — that is a ton of movies! Most days, I felt like a headless chicken, running from one group to the other, helping sort through technical issues. In fact, I never really got to even see the movies until they were done. This was the first time that many students ever did any kind of movie-making (I think three of them have some experience) and considering this fact, my students were stellar at the art of patience, and working out problems, and thinking of solutions to technical issues when they arose. In the course of the week, they learned about webcams, the freeware Stopmotion Animator software, Windows MovieMaker and also a music creation program called Super Duper Music Looper. BUT — no one gave up, a few had to restart all over again (one group: restart twice) and as I let them view all of the movies yesterday and reflect on their experiences at our class blog site, they expressed real gratitude in being able to make movies in the classroom. One student came up to me and said, “This is the best project I have ever done in school … ever.” How can you beat that? What I really like about the project is that you were free to be as creative as you wanted to be. All the movies had origanalallity and character which was great to see. What I would want to change the next time when I do a stop motion video is put a lot more filming in so we don’t have to worry about talking fast and find a back drop that doesn’t show the shadows of people going by. This project was a great experience for me because i don’t know a lot about technology and what’s possible. I had never done anything like it before and what was great was doing it with Sam. We tried to make it humorous and laughed through the entire process!!! Even when we disagreed, we got a solution for every problem, mostly from the help of our awesome computer-wiz teacher, Mr. H!!! THANKS!!!!!!! I think making the movies were really fun! All the hard work for like a 50 second movie, but it was still fun to see our movies come to life. you have to have a lot of patience to do this project. If I could change anything I would use less characters because it was hard to move them all. Also try to balance the work between every member of the group. Over all it went very well! The making of the movies was fun but there was a lot of things that made out movie less awesome because we didn’t notice till editing. We had a lot of technical difficulties and our movie wasn’t as great as it could have been which made us kinda of mad! I had a really fun time making the movies. But it was also a lot of work. Working in a group really helped. It was frustrating to always think you are running out of time. I hope everybody will enjoy my movie. 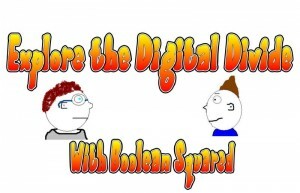 The latest in my Boolean Squared comic is that Boolean has been asked to join his school’s Student Council and has launched a student-led Star Tech team that helps implement technology in his school (props to Steve, my school’s tech guru for giving me the idea). See Boolean Squared and also, grab the RSS feed.